Jonathan Mhondorohuma was born in 1969 in Mvurwi, Zimbabwe. 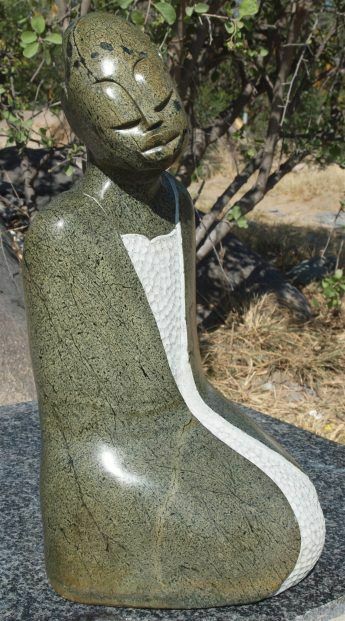 In 1989, Jonathan’s friend, the sculptor Square Chikwanda, invited him up to Tengenenge to experiment with stone sculpture. After six months there, Jonathan moved to Harare, where a chance meeting with the master first-generation Shona sculptor Joseph Ndandarika in Harare lead the artists to work together. The late Ndandarika is widely regarded as one of the greatest sculpting talents Zimbabwe has ever known, and Mhondorohuma was privileged to work with him until his death in 1991. By 1997, Jonathan had established his name as an important new talent in the Zimbabwean art scene, and he was invited to join the Artist Residency programme at the prestigious Chapungu Sculpture Centre, and a close relationship with the gallery remains to this day.